Muscle pain caused by too much exercise or work (overuse). Overuse is covered in Leg Pain. Fracture. This is the medical name for a broken bone. The most common broken bone in the leg is the tibia. The tibia is the largest bone in the lower part of the leg. Children with a fracture are not able to bear weight or walk. Dislocation. This happens when a bone is pulled out of its joint. The most common one in the leg is a dislocated kneecap (patella). Sprains. Sprains are stretches and tears of ligaments. A sprained ankle is the most common ligament injury of the leg. It's usually caused by turning the ankle inward. Also, called a "twisted ankle." The main symptoms are pain and swelling of the outside of the ankle. Muscle Overuse. Muscle pain can occur without an injury. There is no fall or direct blow. Muscle overuse injuries are from sports or exercise. Shin splints of the lower leg are often from running up hills. Muscle Bruise from a direct blow. Bleeding into the quad (thigh muscles) is very painful. Bone Bruise from a direct blow (like on the hip). Called a "hip pointer." Skin Injury. Examples are a cut, scratch, scrape or bruise. All are common with leg injuries. These injuries can be treated at home. Pain Medicine. To help with the pain, give an acetaminophen product (such as Tylenol). Another choice is an ibuprofen product (such as Advil). Use as needed. Ibuprofen works better for this type of pain. Cold Pack. For pain or swelling, use a cold pack. You can also use ice wrapped in a wet cloth. Put it on the sore muscles for 20 minutes. Repeat 4 times on the first day, then as needed. Reason: Helps with the pain and helps stop any bleeding. Caution: Avoid frostbite. Rest. Rest the injured part as much as possible for 48 hours. Stretching. For pulled muscles, teach your youngster about stretching and strength training. First Aid: Apply ice now to reduce bleeding, swelling, and pain. The more bleeding and swelling there is, the longer it will take to get better. 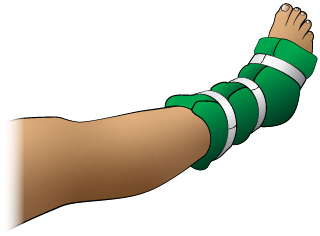 Wrap with an elastic bandage. Treat with R.I.C.E. (rest, ice, compression, and elevation) for the first 24 to 48 hours. 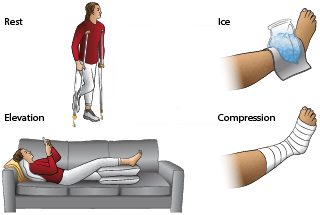 Apply compression with a snug, elastic bandage for 48 hours. Numbness, tingling, or increased pain means the bandage is too tight. Cold Pack: For pain or swelling, use a cold pack. You can also use ice wrapped in a wet cloth. Put it on the ankle or knee for 20 minutes. Repeat 4 times on the first day, then as needed. Reason: Helps with the pain and helps stop any bleeding. Caution: Avoid frostbite. To help with the pain, give an acetaminophen product (such as Tylenol). Another choice is an ibuprofen product (such as Advil). Use as needed. Continue for at least 48 hours. Keep the injured ankle or knee elevated and at rest for 24 hours. After 24 hours, allow any activity that doesn't cause pain. Use an antibiotic ointment (such as Polysporin). No prescription is needed. Then, cover with a bandage. Change daily. 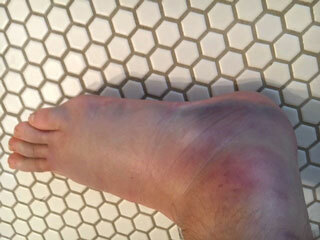 Pain and swelling usually peak on day 2 or 3. Most often, swelling is gone in 7 days. This shows a sprained ankle. The ankle and foot are swollen because they were not wrapped with an elastic bandage right after the injury. Wrap with a snug elastic bandage. 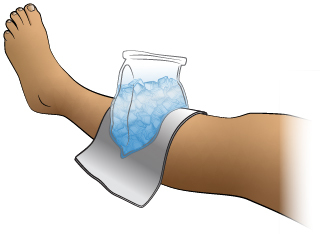 Apply an ice pack (crushed ice in a plastic bag covered with a towel) to reduce swelling and pain. 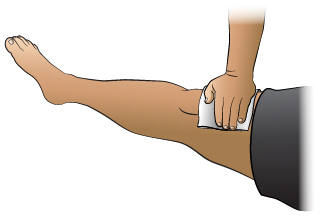 Apply direct pressure to the entire wound with a sterile gauze dressing or a clean cloth. Once the bleeding has stopped, cover with an adhesive bandage or gauze. Wrap a large soft pillow around ankle and foot. Reason: to support ankle and foot and keep bones from moving around. Use tape to hold the pillow in place.